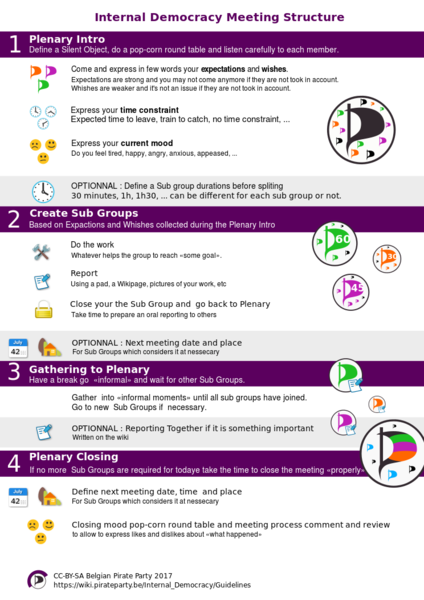 A visual version of the Meeting Guideline (as in June 2017) Other versions may come and overwrite this one. 11:19, 23 July 2017 744 × 1,052 (1.03 MB) Tierce (talk | contribs) Taking comments of the previous meeting (https://wiki.pirateparty.be/Internal_Democracy/Meeting/25_06_2017). Comments where written on a paper. 11:50, 25 June 2017 744 × 1,052 (1.06 MB) Tierce (talk | contribs) With more colors, a title and CC-BY-SA mention. Some changes in the legend too. 01:56, 14 June 2017 1,400 × 1,200 (340 KB) Tierce (talk | contribs) A visual version of the Meeting Guideline (as in June 2017) Other versions may come and overwrite this one. This page was last edited on 16 September 2017, at 11:40.